Today (1/13) get this Hey! Play! 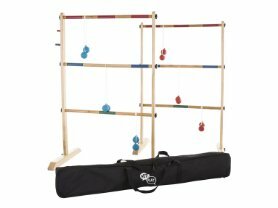 Wooden Ladder Golf Game for only $59.99 (Retail $129.99)! Ladders should be spaced 15 feet apart. Players alternate 3 bolas at a time, playing to 21 points. Top rung is 3 points, middle rung is 2 points, bottom rung is 1 point.